I really made the cake with my friend Bret, who I’ve known since I taught my very first baking class at Cooks of Crocus Hill about 13 years ago. He is a dynamite chef and baker, and I love playing in the kitchen with him. We decided to make this classic Italian ricotta cake after seeing it on the pages of Saveur magazine, just in time for Easter. Bret’s interpretation honored the traditional style of the cake and I went for a more 1973-macramé-hanging-on-the-lanai look. We were in a zone and made, not only the cake and all of its parts, but we also candied all the fruit. I discovered that one of my all time favorite taste sensations is a whole candied kumquat. They become translucent jewels in the process of cooking and the flavor is both tart and sweet. I ate them like popcorn. The candied citrus is a perfect compliment to the creamy smooth layers of ricotta and the orange liqueur soaked sponge cake. 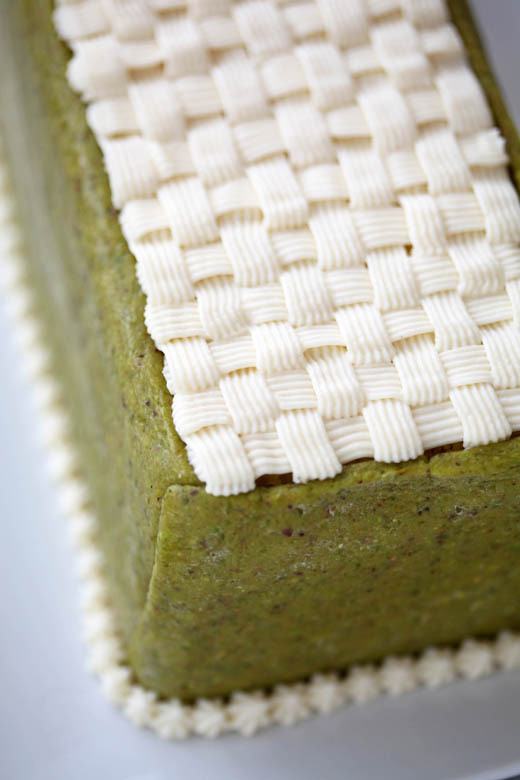 The frame around the cake is made from pistachio marzipan, which is a revelation of its own. 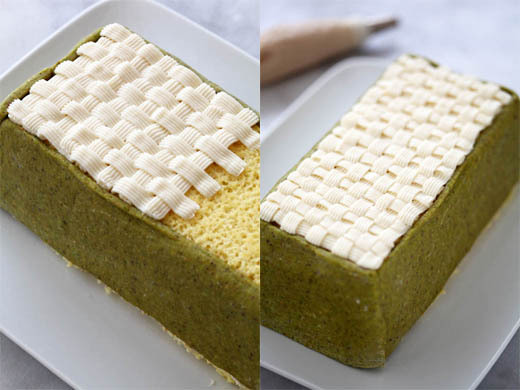 I adore marzipan made with almonds, but this is exponentially better and adds a bit of flash to the outside of the cake; as if the basket weave and candied fruit flower weren’t enough. Sicilian Ricotta Cake (Cassata) Inspired by one I saw in Saveur, but with my own flare for the dramatic. 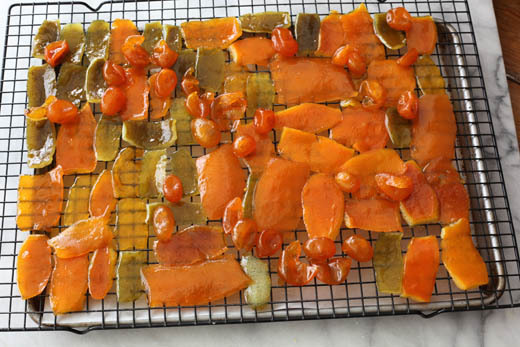 Candied fruit – I recommend you make your own, but you can use store bought in a pinch. We made Meyer lemon, pink grapefruit, orange, lime and kumquats. Make a bunch, they last a long time in the refrigerator, up to a month. Preheat oven to 350°F, with rack in center of the oven. Line a 13 X 18 Baking Sheet with parchment paper and grease the paper. 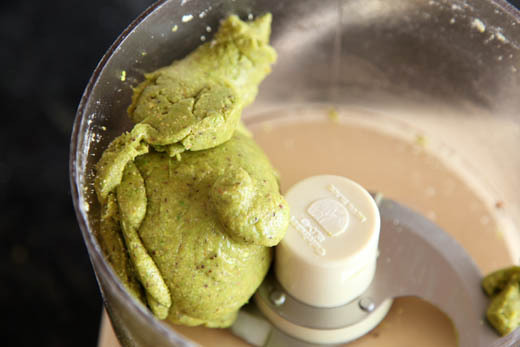 Beat the sugar, zest, and eggs in a stand mixer using the whip attachment, on high speed for about 5 minutes. The eggs will be light in color and very thick. 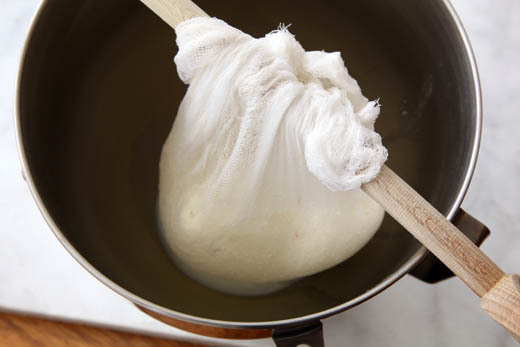 Sift the flour over the egg mixture and fold it in carefully. Pour into the prepared pan and spread it out evenly in the pan. Bake for about 18 minutes or until a tester comes out clean. 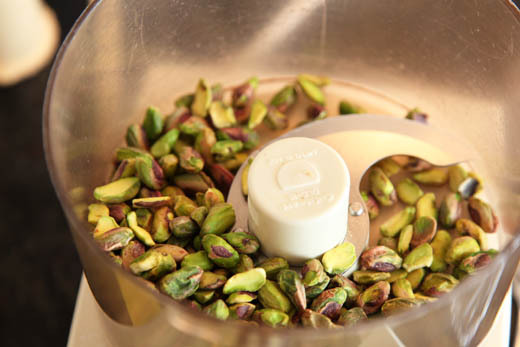 Whisk the egg white in a small bowl and add most of it, but not all to the pistachios and blend until it all comes together in a ball. If the dough is too dry to come together, add the rest of the egg white. 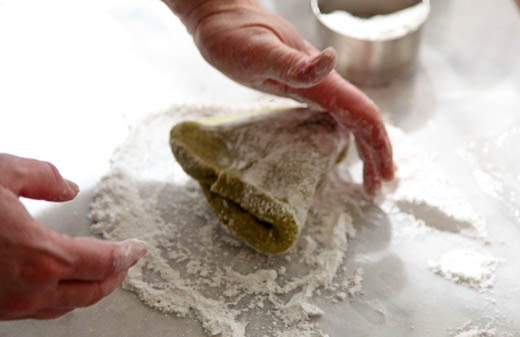 Remove from the bowl and knead for a minute on a surface covered with powdered sugar. 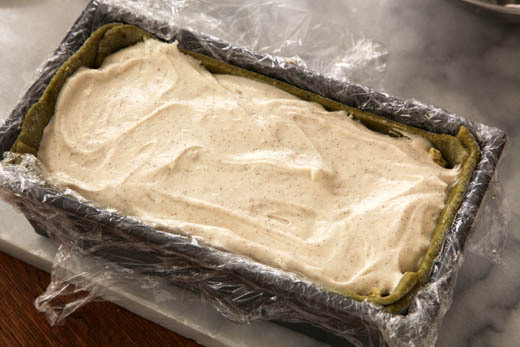 Prepare a 4-1/2-by-8-1/2-Inch Loaf Pan by covering it in plastic wrap. Roll the marzipan in powdered sugar until it is 1/4-inch thick. 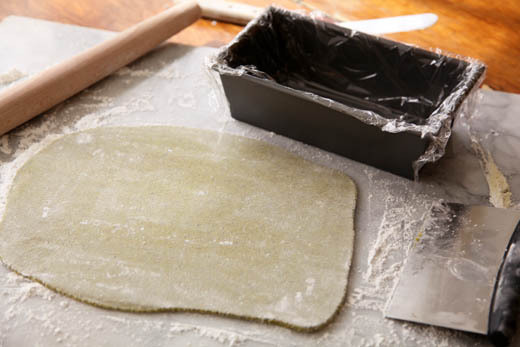 Measure the loaf pan sides and cut the marzipan in strips to completely cover the sides. Set aside. 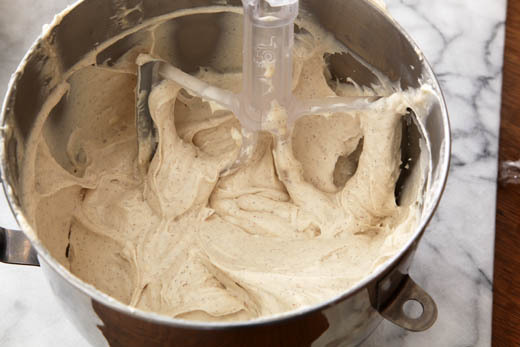 In a stand mixer beat together the cream cheese, strained ricotta, sugar, cinnamon, vanilla, and salt. 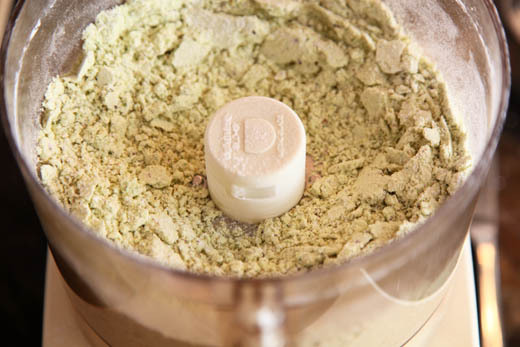 Beat on medium speed until the mixture is smooth. 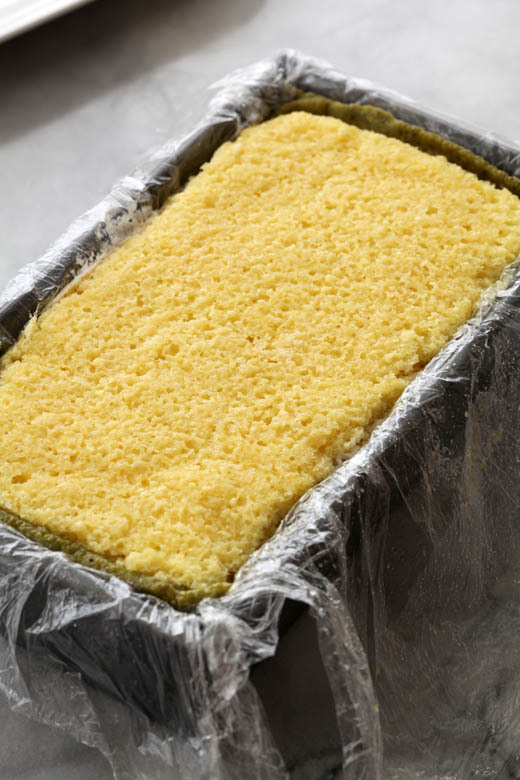 Measure the bottom of the loaf pan and cut a piece of the cooled cake to fit the bottom. 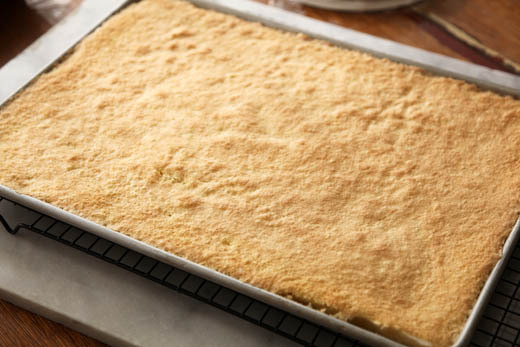 Mix together the simple syrup and liqueur, then brush it on to the cake. You want enough to really flavor the cake, but not so much that it because soggy. Cover the cake with a layer of the ricotta filling to reach almost midway up the pan. Repeat this process with another later of cake, more soaking syrup and ricotta filling. Top the ricotta filling with another layer of cake and soaking syrup. It should come just to the top of the pan. 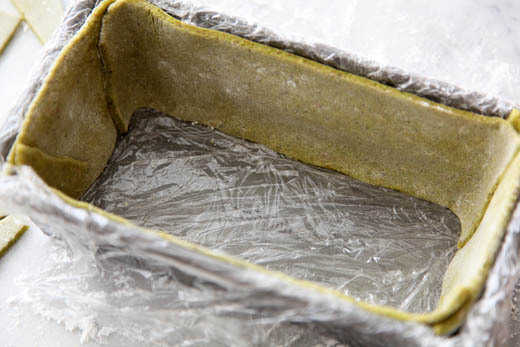 Cover with plastic wrap and refrigerate for at least 4 hours, but overnight is best. In a stand mixer fitted with a paddle attachment, beat the cream cheese, butter, confectioners’ sugar, and zest. Using a pastry bag and a basket weave tip to pipe the icing onto the cake. Here is a Basket Weave 101. Then use a small star tip to pipe a border along the base of the cake. 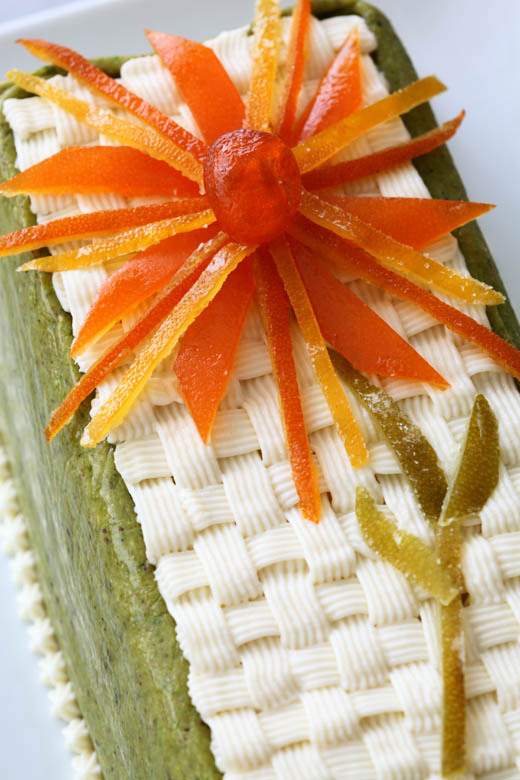 Decorate the top of the cake with the candied fruit in a pattern that makes you happy. I sliced up the fruit to create the petals and stem of the flower. Zoe, I’m speechless! I can see your painstaking work here. Great step-by-step pics! Cake looks SO divine! Holy cow, that is a gorgeous cake. Can you elaborate on how to candy a whole kumquat? I’m experienced with candied citrus peel– but a kumquat?! We have more kumquats than we can figure out what to do with, and this sounds like an exceptional way to use them! I did it exactly the same way I did the grapefruit (follow the candied fruit link in the ingredient list). I was thrilled at how they came out! Stunning. Absolutely stunning! Thank you for the painstaking step-by-step instructions for novices like myself! You can! 🙂 It is a multi step process, but none of it is difficult! It’s just beautiful, Zoe – what a showstopper! I thought about making this when I saw it on Saveur, but it seems too daunting for me. I like your version as well. I am tempted now. Thanks Zoe! Hi Zoe – It was such a great day, cooking with you in your kitchen. I hope we can do it again sometime soon. And for anyone thinking about making this cake. It looks harder than it actually is, so go for it and impress you family and friends. Zoe, you did such a beautiful job on this! My mom was from Sicily – this really impresses me! What great post. I so love your books. I really want to visit Sicily next time I am in Italy! Who gets the end piece with the extra pistachio marzipan? Wouldn’t it be a little too rich? This cake is a work of art. Pistachio marzipan may be my new favorite thing in the future. WOW! This is soo beautiful. 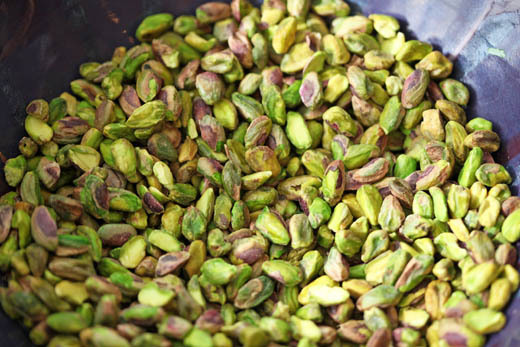 Nd i cant wait to try out the pistachio marzipan. Your step by step pics are great. That’s a lot of work and so gorgeous! I love the fruity flower! That’s such a creative touch. I’m wondering if there is a way to make the marzipan without eggs?? I just read the article in Savuer. 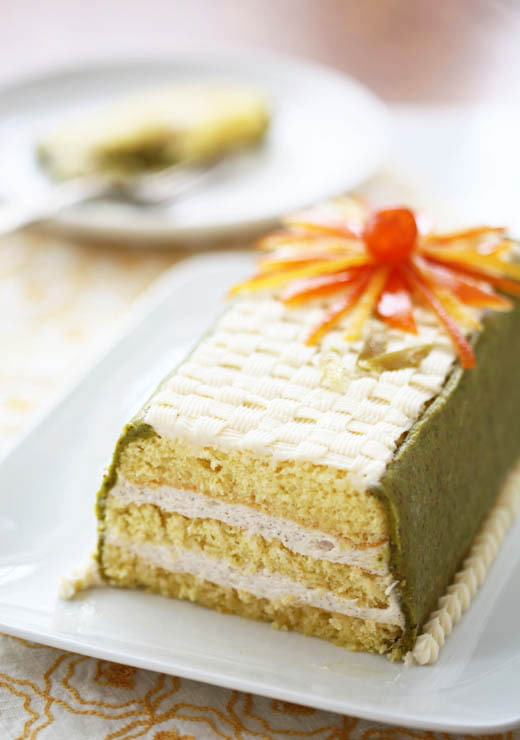 The pistachio marzipan peeked my interest to make it again. 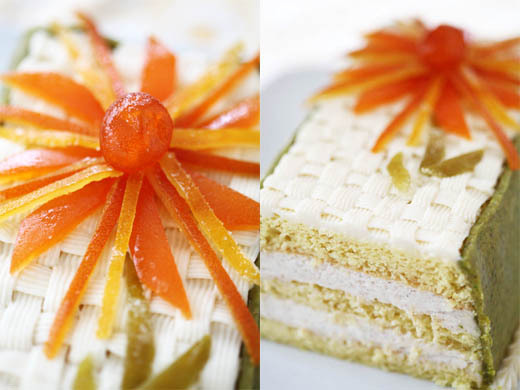 The very first time I candied fruit was to decorate a cassata for my then 13 yr. old dd who was studying Italian. It was soo much fun. The syrup is delicious too on ice cream. I wonder like how you replaced the Grand Marnier with juice and simple syrup. I was going to try the syrup from the fruit but I didn’t think about adding juice to help moisten the cake too. 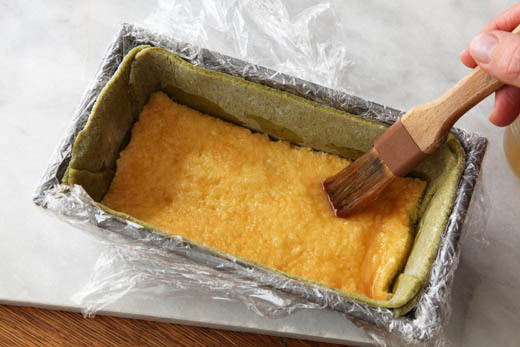 Thanks for posting all the steps and a better way to get the marzipan just right. Are you concerned about the health risks of the egg or do you want a vegan alternative? 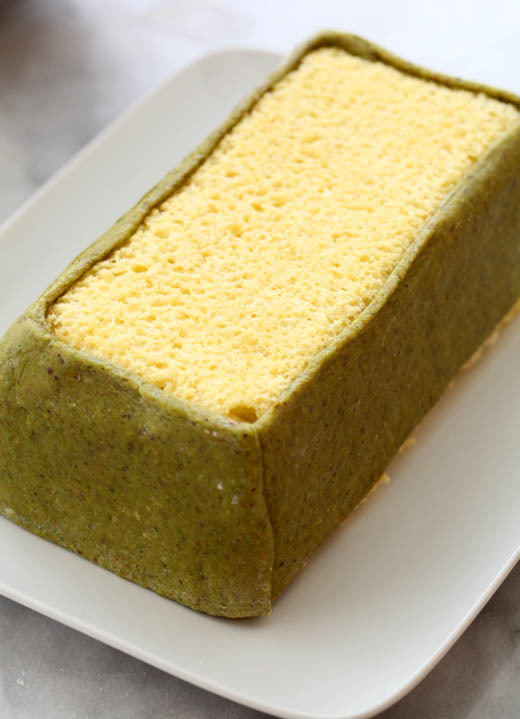 What can I use instead of egg white in pistachio marzipan? Are you allergic to eggs? Depending on the issue I may recommend different things. A Day Spent Baking with ShootingTheKitchen.com!